Are we messengers of life? I took this picture a few weeks ago as I was walking to the church on a Sunday morning. The picture is of a large number of turkey vultures roosting on the water tower behind our middle school/high school. What caught my eye was not just the large number of turkey vultures though. Beyond that what caught my eye was for how many churches this could be a symbol. Let me back up. I am a minister in the PC(USA). As a denomination we are hemorrhaging members each year. I am blessed to serve a congregation that continues to grow and reach out to the community that lives around it. However this is not the case for many congregations within our denomination or some other denominations with which I am familiar. Instead what is happening is congregations get gradually smaller and smaller until eventually there is a small group of individuals to turn off the lights and lock the doors. And that is why the vultures caught my eye. Secularly, Walt Disney quite often used the vultures in his art to depict impending doom or death. The Bible though, quite often uses water as a source of life and nourishment. Here are these vultures perched on a water tower. Within the water tower is life, yet all around the water tower are these birds that are associated with death and decay, leaving their filth all around the structure. 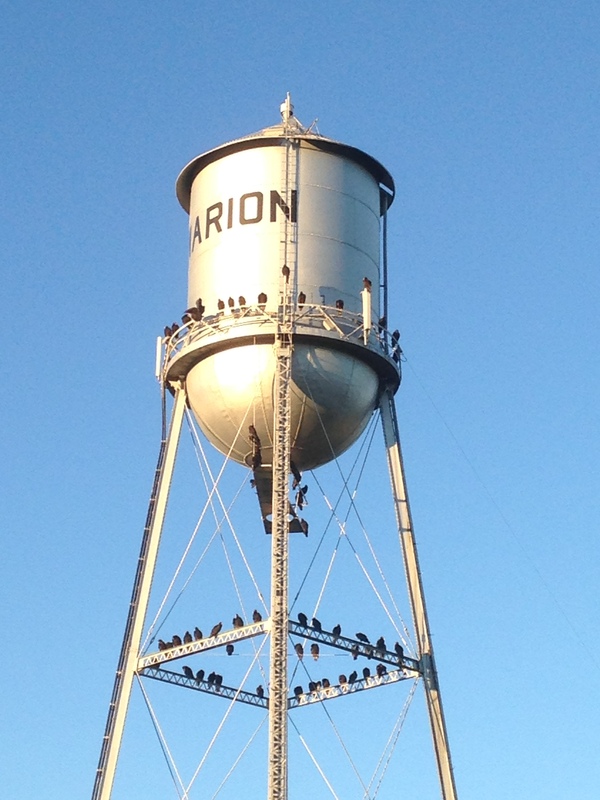 The birds use the water tower as a place to roost and then in the morning as a place to warm up their wings before they begin their day in search of food. As followers of Christ, we have a calling to take the message of where life is found, out to the world. We cannot be the ones who perch in the pews and go out into the world seeking to be fed by that which is decaying and dead. We have, in Christ, the source of life. Let us embrace our new life in Christ and let us show that life to those who have yet to experience it. This entry was posted in Faith and tagged Evangelism, Life, Water. Bookmark the permalink.